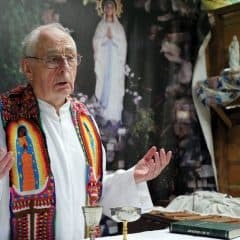 In February 2010, just a month after a 7.0 magnitude earthquake devastated Haiti, Maryknoll Father Dennis Moorman discovered the urgent need for his newly acquired skills. Even though the Haitian patients reported pain and ailments, the priest says, the medical team of volunteers he had come with could not find anything medically wrong with most of them. “They showed typical symptoms of unresolved trauma,” explains Father Moorman, who had just completed his studies in trauma-healing therapy. The survivors were grieving the nearly 300,000 people killed by the earthquake, while “striving to cope with the day-to-day survival demands of finding shelter, food and clean water,” he adds. When she calmed down, she was able to go to that quiet place inside her, he says. After a moment her face relaxed and she started singing and praising God. 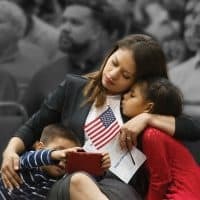 “After this experience, she was able to find a new space within herself that allowed her to shift out of the trauma that paralyzed her and to see new options for feeding her children,” he says. 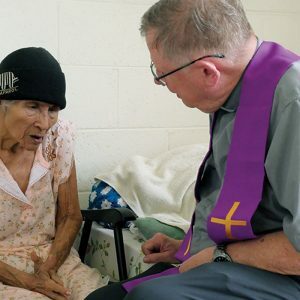 Father Moorman now ministers to people suffering multiple types of trauma—from surviving natural disasters, to growing up in situations of domestic violence, or living with the daily challenges of trying to overcome poverty. “Trauma is anything that overwhelms our nervous system, anything that’s too much for our nervous system to handle,” says Father Moorman. “It affects us physically, spiritually and emotionally.” He explains that trauma can cause depression and lack of energy, or panic and anxiety attacks. It can also cause the body and nervous system to close down, resulting in dissociation from reality, which limits people’s openness to the possibilities of life. 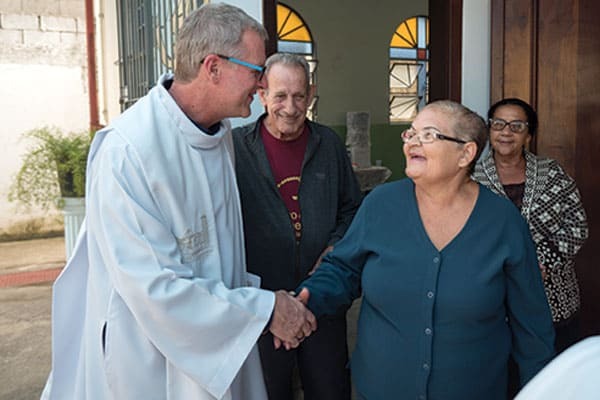 Father Moorman, whose ministry is based in Brazil, returned to Haiti in 2011 with Maryknoll Sister Euphrasia “Efu” Nyaki, a faculty member of the Somatic Experiencing® Trauma Institute in Brazil. Father Moorman says the basic skills for renegotiating trauma consisted of: being in touch with one’s body and sensations, breathing properly, finding healing resources and engaging the body’s innate healing capacity. “Bringing awareness into the physiology of our body is what unleashes its healing potential,” says the priest. 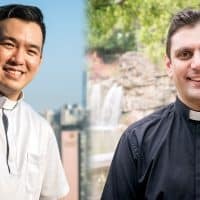 Since their time in Haiti, the two missioners have worked in Brazil, Bolivia, Uruguay, Hong Kong, Japan and Korea to help people overcome the effects of trauma, while training those who would like to sharpen their skills to deal with trauma but cannot afford to study these methods. Father Moorman says people can feel the transformative effects of the workshop. One man said he had not been able to sleep since his wife died and left him to care for their 6-month-old daughter alone. After the second day of training, he said he slept for the first time since the tragedy. 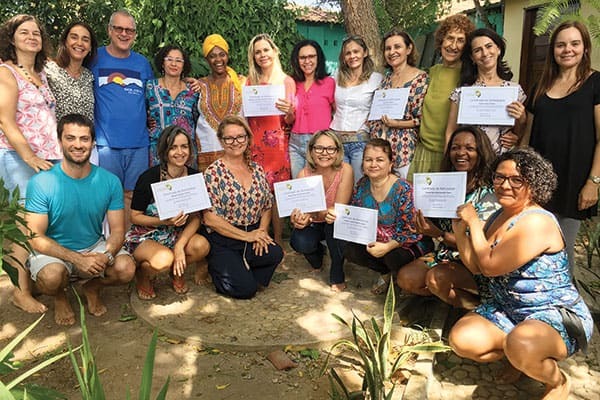 Father Moorman began working with a Somatic Experiencing practitioner to heal his own trauma after years of witnessing violence during his ministry in João Pessoa, Brazil. “I was having nightmares, and I was traumatized vicariously even though I never suffered any direct violence,” he recalls. Seeing the value of this body-awareness approach, he studied for three years to become a Somatic Experiencing practitioner. He was struck by the simplicity of the method for helping others, as well as its impact on his own healing. “It is helpful in ministry because you see results very quickly,” he says. He thought the healing tools would help the people he served in Brazil, because most of them could not afford the time or money to go to traditional therapy every week. 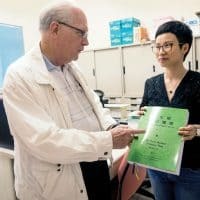 By sharing his knowledge, he could help them learn to manage their own stress, anxiety and issues of trauma to continue the healing on their own. Originally from the countryside near St. Maurice, Ind., Father Moorman now works with different trauma-healing organizations in Brazil, including a holistic healing center led by Sister Nyaki and a restorative justice program, all while working as a priest in Perús, on the northwestern periphery of the city of São Paulo. However, he says training others in trauma- healing therapy around the globe has become his main mission. “You could say the world is my mission now,” he says. 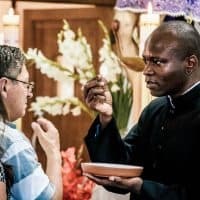 Other Maryknollers have invited Father Moorman and Sister Nyaki to share their trauma workshop in the countries where they serve, with many of the participants volunteering to help others deal with their trauma. After the workshop, the workers would have monthly meetings to continue the healing process and every year Father Moorman and Sister Nyaki would return to provide more advanced training. “When people heal their trauma, they are able to relate better with others and can live fuller lives,” says Sister Nyaki, who is originally from Tanzania. 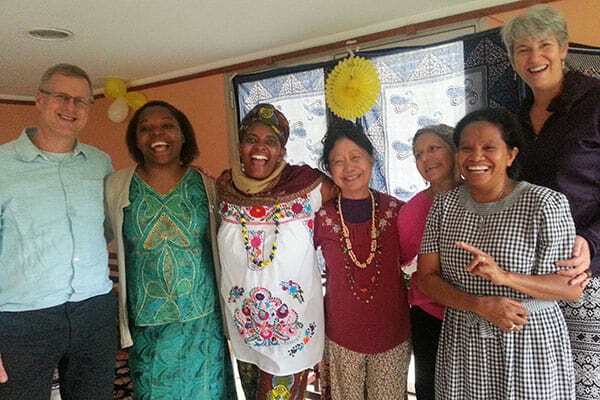 The possibility to help others find wholeness after a traumatic event led Tania Avila Meneses to bring the healing workshops to the Maryknoll Mission Center for Latin America (CMMAL) in Cochabamba, Bolivia. Avila says the holistic techniques people learned allowed them to use body awareness as a springboard for healing. 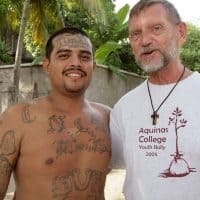 Father Moorman adds that training community leaders across the globe multiplies their efforts to share the tools to move beyond trauma and suffering. 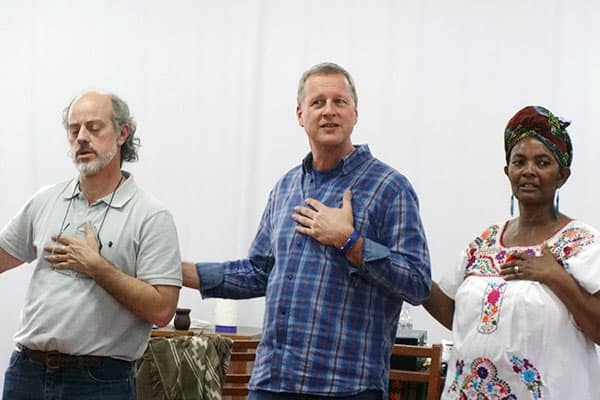 Whether in Haiti, Korea, Brazil, Bolivia or other countries he and Sister Nyaki are invited to, Father Moorman hopes their efforts continue to empower others to lead hopeful lives after trauma. Photographer Nile Sprague also did reporting for this story. Featured Image: Crosses mark the graves of victims of the 2010 Haiti earthquake. Missioners have helped to heal survivors’ trauma.